There are many types and causes for snoring and sleep apnea problems. One of the most common types is obstructive sleep apnea. This occurs due to intermittently relaxed throat muscles making tongue and lower jaw block your airway during sleep. Our dentist can make Oral appliance to wear during sleep which helps to position your tongue and lower jaw in forward position. Since sleep Apnea might be the cause for several health problems, we will highly recommend getting this condition treated. 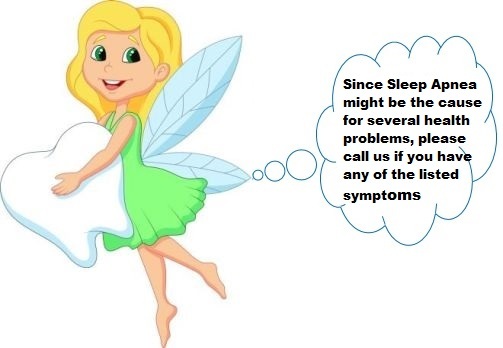 If sleep Apnea is not treated, the symptoms of sleep apnea like disturbed sleep, excessive sleepiness during the day, high blood pressure, heart attack, congestive heart failure, cardiac arrhythmia, stroke or depression can develop.